Smoothies have been a real lifesaver. I can cram them full of nutritious ingredients and the kids love them because they taste so good. A few years I jumped on the green smoothie bandwagon with a vengeance and ended up with my IBS symptoms flaring up to be the worst they had been in more than a decade. I think a combination of too much fruit and the wrong type of protein powder were to blame. Being dairy free I was using a vegan pea protein which I later learned can indeed cause digestive issues. I was never comfortable giving it to the kids either and with good reason. After much research I stumbled across Thriving Protein by Nutra Organics which is a blend of different protein sources like sprouted brown rice as well as red algae and high vitamin D mushroom powder. It is packed with protein and essential vitamins and minerals and provides a complete amino acid profile. It's good stuff! There are 3 flavours to choose from and after some experimentation the CacaoChoc one is my kids favourite (although they do drink all 3). This smoothie has been their snack of choice lately and while it definitely doesn't look pretty (hence the name they came up with!) it does taste delicious! 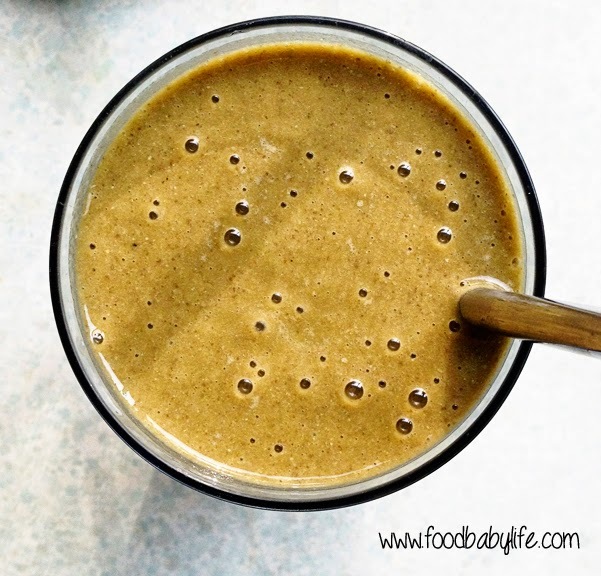 My boys love this smoothie and the fact it looks like slime or monster mud makes it just that much more appealing for them! Place all ingredients into the thermomix or other high powered blender and blitz for 1 minute or until thick and smooth and completely blended. Pour into a glass, add a straw and drink!